Foreword (not forward): A foreword is sort of like an introduction in that it is supposed to prepare the reader to get the most out of your book, but it’s usually written by someone other than the author. A foreword is kind of a long endorsement of the author and the book written by someone (hopefully) the reader knows of and respects and, by proxy, puts the author and the book in the best light as the reader nears page one (we’ll get into this more in our article about endorsements). Preface: This is generally a short piece, always written by the author, that tells the story of how the idea for the book came to be and usually acknowledges those who the author would like to thank for whatever role they had in the book coming to be or the author’s personal inspiration (my mom, dad, suppose, kids, publisher, professor, pastor, etc.) More on this in our article on frontmatter. Introduction: This is where you, the author, set the stage for your reader. You’re ‘introducing’ the reader to your work, explaining the question or situation your book answers, why you think it’s a question or situation worth a book’s worth of answer, and telling her what to expect along the way. You’re preparing the reader to enter the world that is your book. Remember, you know all about the subject of your book, you wrote it. But your reader doesn’t necessarily share your frame of reference. You’ve got to paint that picture, put your reader in that frame of reference – that’s what needs to be accomplished in the Introduction. Why am I telling you to write your book’s introduction, after you’ve written its conclusion? What is your introduction supposed to accomplish? The answer to question 2 has a lot to do with the answer to question 1 so let’s start there. Before jumping right into page one, chapter one, readers may appreciate knowing what they’re getting into – a ‘lay of the land’ if you will. It’s important to remember that your reader, most likely, isn’t coming into this with the same frame of reference you have. After all, you wrote the book. Your reader may need to be introduced to a lot of ideas you take for granted. It’s helpful to state the problem your book addresses or set the scene your story covers. It may also be helpful to the reader to give them a bit of a roadmap in advance of chapter one. If your book is broken up into three main sections, for example, tell your reader why you broke the book into three sections and what they should expect to get out of each section. For example, I’ve broken How to Write a Book in 30 Days into three major sections: ‘Creating Your Content,’ ‘Organizing Your Content’ and ‘Building Your Book.’ I broke the book into these three sections because I see them as related, but independent stages of turning an idea into a finished manuscript. At the end of section one: ‘Creating Your Content,’ the reader should have a good understanding of how to develop the habit of writing regularly, gathering ideas and fleshing out ideas into intelligible, meaningful, useful content. By the end of section two, ‘Organizing Your Content,’ the reader should be able to organize her content into a related, logical progression. The content that explains idea number one, should flow naturally into the content that explains idea number two. Those two ideas, in progression, should prepare the reader for idea number three, and so on. Section three is all about gathering the pieces many authors never consider (like front matter and back matter) that actually turns a manuscript into a book. In the introduction, I explain the reasons for these three sections in advance so the reader knows what to expect, before getting into page one chapter one. That brings us back to question number 1: If the introduction is in the front of the book, why wait to write it until after you’ve written the conclusion? Good question! Let me ask you this. Would you rather hear about your friend’s trip around the world before they leave or after they come back? The answer is easy – after they come back. That’s because, no matter how well your friend has planned their trip, they don’t really know how it turned out until the trip is over. You have an idea of everything you want to cover in your book and the steps you’ll need to take to get from beginning to end. But the truth is that, no matter how well you’ve got it planned out, you really don’t know completely what your book is about or how it flows or is organized until after you’ve created and organized your content. A lot of twists and turns may appear in the road that you never anticipate beforehand. Until you’ve taken the trip yourself, there’s no need explain it to others. Until you’ve written and organized the body of your book you’re not ready to introduce other to it. 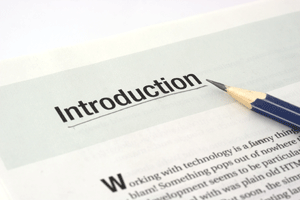 *NOTE: Are you stuck on your book’s introduction or any other part of the process? Leave me a message in the comment section below, I’d love to help.